This is my first post and I'd like to say hi to everyone. 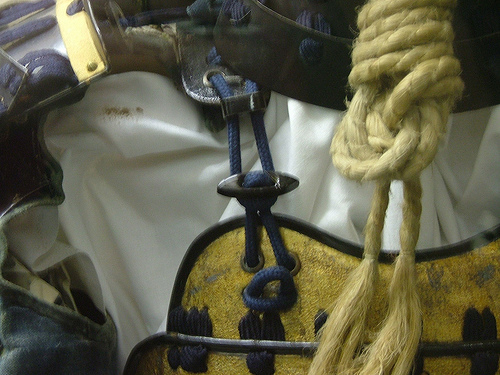 What interests me is the construction of the strapping system used in Japanese armour. How did they attach the laces that hold cuirass and the shoulder straps together without making any ugly knots ? Hi, unfortunately I don't have anything to add, but I wanted to comment that I recently went to the Lords of the Samurai exhibit at the San Francisco Asian Art Museum. The exact details that you're asking about stood out to me, too, and intrigued me more than any other thing I saw! There are the 4 holes where the laces connect to the front plate. Each lace goes through the top hole on its side, and then comes back out the bottom hole. On your photo, it looks like the ends are then tucked in the other bottom hole. This doesn't look very secure to me. What I have seen on other armours is that in this part, where the laces go from one bottom hole to the other, it looks as if the lace has been unbraided, and then both laces rebraided together. That is, the lace between the two bottom holes is a double-thickness braid, a splicing of the two ends together. This was almost certainly replacement lacing, rather than original. In your photo, this hasn't been done - you can see the two side-by-side between the holes. I don't imagine that the ends would be knotted on the inside. If you wanted to knot them, you'd knot them in some kind of fancy decorative knot on the outside. I've seen photos where there are a pair of decorative knots further down, with the knotted laces looking the same as the shoulder laces. If they're the same laces, they'd run about 10-15 cm or so along the inside before re-emerging to be knotted. EDIT: Saw a photo where the cords coming out of the bottom holes appeared to be tied in a knot. A neat, compact knot.